Anti-pesticide forces are seeing some success in convincing local governments to ban “cosmetic” pesticides. The anti-pesticide activists define cosmetic pesticides as those used to make lawns and the general landscape look better. In other words, most of the pesticides used by the green industry. In July 2013, Takoma Park, Md., passed the Safe Grow Act of 2013, which generally restricts the use of “cosmetic” lawn pesticides on both private and public property throughout the city. Takoma Park commonly is recognized as the first local government in the U.S. in more than 25 years to take an action banning pesticide use. The Takoma Park action was followed last November by the community of Ogunquit, Maine, which voted to prohibit the use of pesticides for turf, landscape and other outdoor pest management. So how likely is it that this movement will spread to other communities in these states and around the country? The industry pesticide group Responsible Industry for a Sound Environment (RISE) reports that in Maryland, Montgomery County has a bill under consideration similar to the Takoma Park ordinance. Likewise, the anti-pesticide advocacy group Beyond Pesticides reports that other communities in Maine are interested in passing ordinances similar to the action taken by Ogunquit. How fast can a movement like this spread? In Canada the forces against cosmetic pesticides were well organized and, in a matter of a few years, had swept across the country. In 2009, the provincial government of Ontario followed Quebec in implementing a ban on the use of cosmetic pesticides. By 2010, according to anti-pesticide group Coalition for a Healthy Ottawa, 171 Canadian local governments had imposed laws regulating or banning pesticides, covering 80 percent of the country’s population. In the U.S., Maryland and Maine are two of only seven states that do not preempt local governments from regulating or banning pesticides. Other states are Alaska, Hawaii, Nevada, Vermont and Utah, according to RISE. The other 43 states have some form of preemption law that prohibits local governments within their states from banning or regulating pesticides. So unless the 43 states change their laws or a court decision strikes them down, the anti-pesticide movement will have trouble taking hold in local governments outside of these seven states. But will state preemption laws hold? The U.S. Supreme Court in 1991 held that local governments have the authority to restrict pesticide use under federal law. This decision led to the plethora of state preemption laws now on the books to prevent local governments from implementing pesticide regulations in the 43 states. Local governments already have the authority to regulate pesticides but for the state preemptions. Cracks are beginning to appear in the state preemption laws themselves. In a decision that rocked Pennsylvania, the Pennsylvania Supreme Court in 2013 struck down the portion of a state law that preempted local governments from passing zoning ordinances that restricted gas well drilling. The high court held that the state constitution prohibited the state government from restricting local government actions that protected the environment, public health and safety. There is concern that this decision could be used as precedent for challenging other state preemptions on local government action, such as the pesticide preemption. So far, such a case has not been brought before the Pennsylvania Supreme Court, but activists have said that they are looking for such a case. As an industry, we need to be aware of what is happening in the communities in which we work. 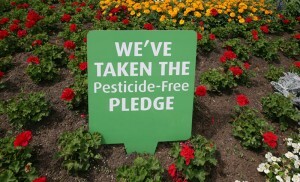 The anti-pesticide movement in Canada was well organized and moved simultaneously across the country to urge the adoption of the local anti-pesticide laws. The movement caught the Canadian industry and the provincial landscape trade organizations flatfooted. If you hear about local governments in which you work considering anti-pesticide laws, attend public meetings and speak up for the responsible use of pesticides in the managed landscape. Alert other landscape companies in your area, your state landscape and nursery association and RISE. Your state association and RISE have science-based resources that you can draw upon to counter the anti-pesticide forces. Within your own company, be sure you are practicing integrated pest management (IPM). IPM will make your pest control efforts more effective and it will save you money. But it takes training and knowledge. Most cooperative extension services of your state land-grant universities provide this training at a reasonable cost. Then let your customers know you are using IPM to apply pesticides in a responsible way that minimizes their use. The anti-pesticide activists will be going door-to-door spreading their message. Get ahead of them with your message before it’s too late. 2 Comments on "Government Affairs: Crackdown on ‘cosmetic’ pesticide use"
Thanks for taking the time to post. You raise a very good point. We are a diverse industry from small entrepreneurs to publicly-traded companies. I’ve found that there are a wide range of practices in our industry, regardless of company size. One of the ways that you can find out what your customers need and want is by having the conversation with them that I suggest. It sounds to me that you are already doing that. Well done! Consumers will paint our industry with a broad brush. By communicating with our customers about our practices, as you are doing, we help the consumer get a more accurate understanding of how we care for their landscape and the environment and that benefits the entire industry.